An ad released Monday by the Obama-affiliated super PAC Priorities USA suggested that Republican challenger Mitt Romney may have played a part in the death of a cancer-stricken women—a smear that has opened the super PAC to condemnation from all sides. The advertisement, which will air in swing states across the country, features a former steelworker, Joe Soptic, who says that Bain Capital’s 2001 decision to shutter his plant played a role in his wife’s death in 2006. However, subsequent reports have revealed that the steelworker’s wife retained health insurance through her own job during this time and that he had the opportunity to but did not add her to his own insurance plan once he took a new job. The plant also closed two years after Romney left Bain in 1999. The Obama campaign has refused to condemn the ad, which is part of a $20 million Priorities television campaign. Despite the insistence of campaign officials that they did not know Soptic’s story, the campaign featured the steelworker in one of its own advertisements as well as on a conference call. 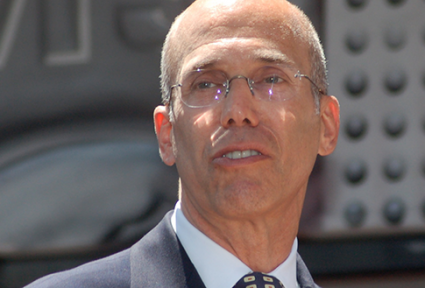 Katzenberg is Obama’s single largest donor, providing the super PAC with a $2 million boost, bundling more than $2.3 million for the campaign and co-hosting a star-studded $15 million fundraiser for the president in May. The SEC is investigating Dreamworks for allegedly bribing Chinese officials to develop a studio overseas. Vice President Joe Biden and Secretary of State Hillary Clinton helped to broker the $2 billion deal. Jacobs is another $2 million donor to Priorities USA and has given $100,000 to George Soros’ American Bridge 21st Century, a super PAC closely aligned with the White House. Jacobs, who has an estimated net worth of nearly $2 billion, pioneered the practice of outsourcing telecommunications jobs; his company has sent $16.5 billion in cash overseas to cut costs and avoid the highest corporate tax rate in the world. Eychaner, a reclusive millionaire media mogul and gay rights activist, injected $1.5 million into Obama’s super PAC, as well as $1.75 million into three other Democratic super PACs for the 2012 election. A Chicago native, he has been a top moneyman to Democrats over the years. He gave at least $3.2 million in 2004 to Democrats and uses his foundation to distribute millions every year to liberal causes. Stiefel donated just over $1 million to help finance the super PAC’s advertising activities, according to the Center for Responsive Politics. Stiefel, a veteran liberal philanthropist, has given $5,000 in donations to Obama, as well as to Massachusetts Senate candidate Elizabeth Warren and to Patrick Murphy, the Democratic challenger to Rep. Allen West (R., Fla.). She has also given $61,600 to the DNC in the 2012 cycle. Goldman set aside $1 million of the money she has earned as "the world’s premier vegetable gardener" for the Obama super PAC. Goldman is the daughter of New York City Real Estate mogul Sol Goldman, one of New York City’s wealthiest landlords at the time of his death in 1987. Amy and her three siblings battled with their mother over the late Goldman’s $1 billion empire in an ugly inheritance case that was eventually settled. Mostyn contributed $1 million to Priorities USA, along with $500,000 to the Democratic House Majority super PAC, according to the Center for Responsive Politics. Mostyn has been an active opponent of tort reform, contributing $3 million to trial lawyer-backed groups to oppose Texas Gov. Rick Perry and other pro-tort reform lawmakers. One of the longtime Democrat’s most controversial tactics has been opening up his wallet to Republican primary challengers who pledged to oppose tort reform. Ahmed contributed $1 million to Priorities USA, as well as tens of thousands in donations to the DNC and Democratic Senators in swing states, such as Florida’s Bill Nelson and Pennsylvania’s Bob Casey. He owns a California-based medical billing company, Landmark Medical Management. HBO host and militant atheist Bill Maher gave Obama’s super PAC a much-needed $1 million boost in February as it struggled to match the fervor and cash of pro-Romney groups. Maher has found himself embroiled in controversy for often calling conservative women, such as Sarah Palin and Rep. Michele Bachmann (R., Minn.), anti-female slurs. Haney contributed $1 million to Priorities USA. The Tennessee real estate developer, who owns a $23 million Florida mansion built by the Hearst family, has been at the center of a number of federal indictments, lawsuits, and fines. He was indicted for reimbursing associates for making $200,000 in donations to the Clinton/Gore campaigns in 1992 and 1996, and was later forced to pay $12.7 million in damages for a controversial bond sale. Freeman donated $1 million to the super PAC in June, the culmination of four years spent defending the president. An outspoken Obama supporter in 2008, the previously apolitical Academy Award winner has become increasingly antagonistic toward the president’s critics. In September 2011, Freeman accused the Tea Party of being motivated by nothing more than racism.